Sometimes the scenery or the company can raise the mundane (and not so tasty) to culinary acceptance, if not culinary heights. Like that bottle of wine that tasted so good on the impromptu picnic you pulled together in France. You remember, you were driving a Sunbeam-Talbot roadster (like the one Grace Kelly had in "To Catch a Thief") from Lyon to Nice with that beautiful blond (or substitute a tall and handsome gentleman) and found that perfect spot in the Alpes-Maritimes. The view was breathtaking, the wine divine, the charcuterie impeccable, and that perfectly-made pan bagnat! 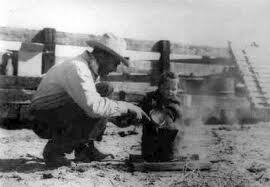 Cowboy coffee is relatively easy to make. Boil water. Add grounds. Stir gently. Let it brew for about 5 minutes. Pour yourself a nice hot cup of coffee, gently, so that as few grounds as possible get in your cup. We suggest the following environmental additions to ensure your cup is passably drinkable. Find a scenic location, preferably with crisp, cool, if not cold, mornings. If you are very far from the Rocky Mountains, try the Appalachian or even the Poconos. Make sure you boil the water on a campfire. Use beat up camping pots for brewing to lower taste expectations and add authenticity. Horses in the background are especially helpful. Additional advice for finer brewing include brewing the coffee the morning after a 25 mile hike, drinking it after a cold plunge in the nearest spring-fed stream, or having it served to you while you are still in your sleeping bag by your gorgeous companion.